Work from Leeds, Durham University, the Byrd Polar Research Center and University of California, Irvine, have taken a deeper look into melt lakes forming on the Greenland Ice Sheet. There modeling was for melt lake formation in the melt zone. The “melt zone” is that area around the edge of the ice sheet that melts every summer. Some years the melt was bigger than others. In 2012, the ice sheet melted all the way to the top above 11,000 feet. This is a very rare occurrence that only happens when the earth is as warm as or warmer than it has been in 120,000 years..
Their modeling predicted the current advance of melt lakes inland as the temperature has warmed to be 35 miles since the 1970s. This agreed well with the measured advance of 34 miles. By 2060, the model predicts another advance of 30 to 35 miles for the medium and worst-case warming scenarios of the IPCC. (RCP 4.5 and RCP 8.5). They simulated a 7,700 square mile area of southwest Greenland. Since the 1970s, the equilibrium line, or that elevation of the ice sheet above which the snow never melts in a single season, has risen from about 1400 feet or over a quarter of a mile. From the edge of the ice in southwest Greenland, the melt line was 50 to 80 miles in the 1970s. Now it is 85 to 115 miles. By 2060 it will be 115 to 150 miles inland. Greenland’s width, about 400 miles north of it’s southern tip is 300 miles, so melt will extend all the ay across the southern third of the ice sheet. Extrapolating this melt area across the rest of Greenland would mean significantly more than half of the ice sheet would melt on average average summer. Measured data and our researchers modeling both showed a steady advance of about a third of a mile per year until 1995 when the rate began to accelerate to its present 1.9 miles per year—a six fold increase or 600 percent. Nearly half (40 to 50 percent) of the water from melt lakes drains through the ice through moulins, mostly to the bottom of the ice sheet. (Arnold 2014) The authors note that 13% of Greenland’s melt lakes drain in only a few hours. Some of these lakes can be more than a mile across. The news from this team is that current ice loss models do not consider these lakes. When they drain, they lubricate the ice in many instances causing increased discharge and iceberg production. This melt water also has a thermal impact. It is warmer than the ice below and much of that heat gets transferred to the ice and underlying rock. Implications are that ice sheet discharge will increase when these things are taken into consideration. 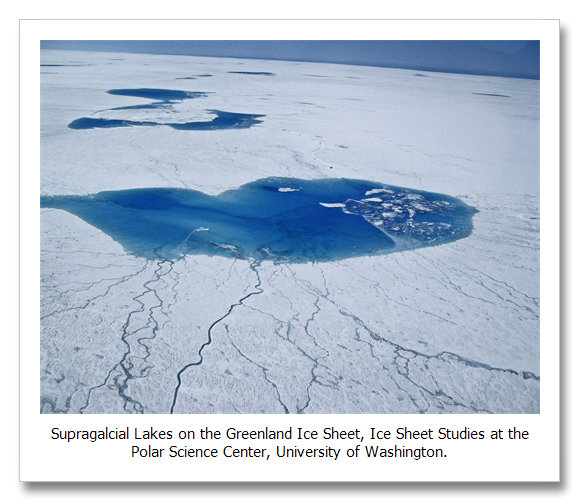 Leeson et al., Supraglacial lakes on the Greenland ice sheet advance inland under warming climate, Nature Climate Change, December 15, 2014. Arnold et al., High-resolution modeling of the seasonal evolution of surface water storage on the Greenland Ice Sheet, The Cryosphere, July, 4, 2014. Howat et al., Expansion of meltwater lakes on the Greenland ice sheet, Cryosphere, February 1, 2013.